I finally uploaded my 2016 favorites on Monday so today I thought I'd share with you all my goals for 2017. I was originally going to make this about blogging goals only but then I thought of a couple goals I really wanted to include. I debated on whether or no to do this post. I thought, who would want to read my goals? Why would anyone care? But I decided to write it anyway. I decided to do it for myself. If I write out my goals and post them here I have to hold myself to them. At least a little bit. If I have them here I'll be more motivated to keep to them. So maybe no one will read this but I'll have these sort of like a promise to myself that I'm going to do, everything on my goals list for 2017, or at least try. So lets talk goals. I have so much more motivation right now than I had this time last year. I have so much excitement going in to this year and what I want to do with my blog this year. 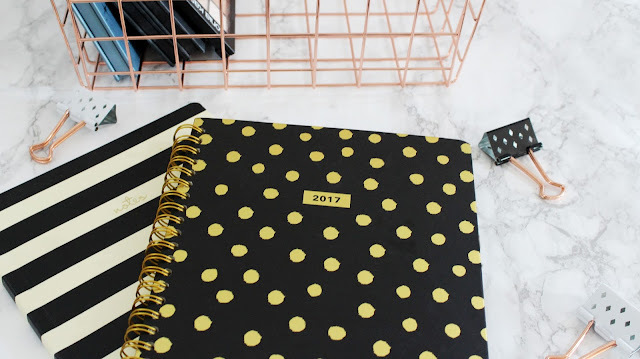 So here are 5 goals I have for my blog and myself in 2017! The biggest blog goal I have this year is how many posts I upload. In 2015 I uploaded 50 posts and in 2016 I only uploaded 34. I want to upload more this year. So far I've been 3 posts a head of myself. I hope to keep it up for the whole year. Going hand in hand with more uploads I want to change my upload schedule. When I started I uploaded new posts every 6 days. I did it for all of 2015. Then in 2016 I lost a lot of motivation and my upload schedule went out the window. I decided this year I want to try to upload every other day this. I've managed to do it for the past 2 weeks. I hope I can keep up this momentum all year. I have some really exciting ideas to write about and I am really excited to keep writing. I really hope to keep of this upload schedule. I use a ton of images from stock photo sites. They are a great source but I use them a little too much. I really want to make sure I use my own photos more. I take a lot of photos for this blog but not enough. I just wrote a post about My 2017 Reading List last week. I want to read all of those books and then some. I didn't just lose motivation for blog posts last year I lost motivation for reading too. I want to read more this year! I love writing and I've had an idea for a book floating in my brain forever. I've had the first 2 chapters written for about 2 years. I really want to finish it. It needs to be finished. I also recently came up with the idea for a completely different book that I really want to write. I will finish one of them by 2018! So those are 5 things I want to accomplish in 2017. I wanted to keep the list short and simple. You don't want to set too many goals or goals that are way to farfetched. When you try to think of goals try to limit to a maximum of 5 and make them reasonable. Don't set the bar so high that you can never reach it. You can always raise it little by little as you reach your goals. Well that got a bit deep. So what are your goals for 2017? Let me know in the comments! Photo Credit: Cover Photo - Photo from pexels.com and edited by me in Photoshop. Thanks! I'm glad you enjoyed! 3 times a week sounds like a great goal! And taking blog photos is one of my favorites parts! I hope you reach your goals! It's going great! I'm posted 85 posts so far this year, uploaded every other day without missing an upload day and used a ton of my own photos. My reading list hasn't been going to well since I've been busy. Same goes for my book. I need to get on that. I'm posting a 6 month check in soon!